Inflation in the Eurozone has apparently reacted very well to the accommodative monetary measures put in place by the ECB, otherwise known as Quantitative Easing. 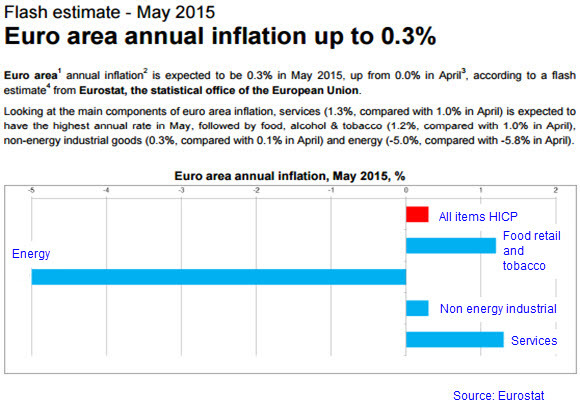 The flash estimate of the Harmonised Index of Consumer Prices (HICP) for the year to end May 2015, released yesterday by Eurostat, shows a lift to 0.3% from 0% previously, beating the consensus estimate of 0.2%. Most encouragingly the food, alcohol and tobacco element shows a significant rise from the last time out. Energy is still by far the biggest driver of deflation, but there is nothing the ECB can do about that. Indeed it is not something it would want change, given the beneficial effects on individuals and industry (outside of the energy industries) of the lower prices for energy related products. 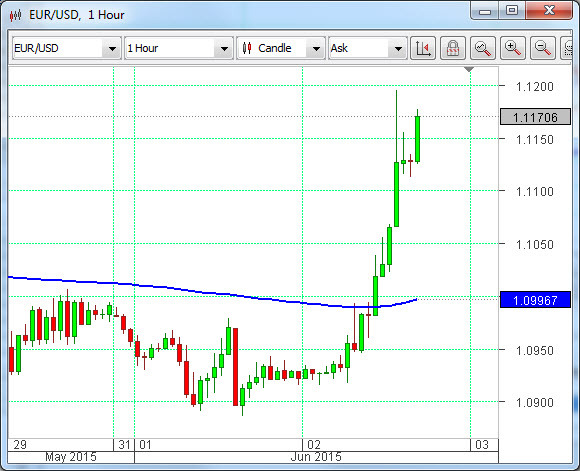 The inflation outcome provided a useful lift for the Euro. Mario Draghi and other ECB officials have been adamant that QE will continue regardless of inflation or any other indicator, but the market can, at times, show a reflex reaction to such reports. There may also be an element of a relief rally on the news that the leaders of Germany, France, the EU Commission, the ECB and the IMF all met in Berlin yesterday, reportedly to put in place a proposal for the Greek government with a view to resolving the bailout crisis afflicting that member state, for once and for all. Perhaps market participants took the view that, with all that heavy firepower coming together, something positive must be about to happen. Mr. Draghi will also be on stage later today for the ECB monetary policy statement and press conference. No doubt he will be quizzed on this very subject by the journalists present.